Street offerings real time and receive orders right in Zia Trading … better offerings = more trades! See with which ATS you did trades for any period. 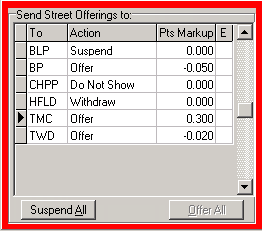 Select each destination and markup/down from the street offering. Destinations can be set for each trading account. Offerings can be changed from Publish to Do Not Show with one click. In addition, we are able to post offerings to all members of MuniBrokers. However, as they are not an ATS we cannot receive auto executions. Trades must be done by voice. The list of MuniBrokers members is shown below.